This test is used as a measure of behavioral despair. When rats are forced to swim in a closed space from which they cannot escape, they will eventually stop attempting to escape and become immobile (except from small movements in order to keep their heads above the water). The immobility is thought to reflect a state of despair. 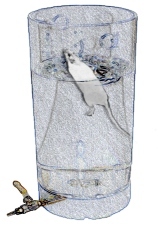 Adapted from Porsolt (1978), in this task the rats are individually placed in a vertical cylinder containing water, maintained at 25°C for a set length of time (usually 15 minutes). Twenty-four hours later, the rats are placed in the same cylinder and during a five minute testing period, the time spent immobile is measured. The rat is considered immobile whenever it remains floating passively in the water in a slightly hunched but upright position, with its head just above the water surface. The test is quite sensitive to antidepressant drugs and is now used routinely as a method for screening novel compounds. An effective antidepressant agent will stimulate the animal to swim and attempt to escape for much longer periods of time (i.e., compared to placebo controls).